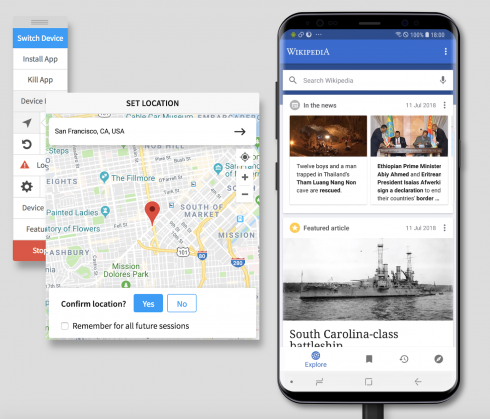 BrowserStack is announcing new debugging tools and native mobile functionalities to its web and mobile app testing platform. In addition, the company announced it is adding new devices to its Real Device Cloud coverage with support for Samsung Galaxy S9, S9+ and the 2018 Apple iPad. Support for iPhone 6, 6s, 6s Plus and 2018 Apple iPad, Video-Log Sync, App Profiling, Google Pay and Google Play Billing will all be available in Q3, BrowserStack said. Live, which includes pre-installed developer tools on remote desktop browsers and mobile devices. The new native mobile functionality includes increased test coverage, network simulation, push notifications, GPS geolocation and Google Pay. Apple today announced an update to the MacBook Pro with faster performance and new pro features. According to the company, developers can now compile code faster than before and run multiple VMs and test environments. Updates include Touch Bar, a 70 percent performance increase, support for 32GB of memory, a True Tone display and a quieter keyboard for typing. Data warehouse Snowflake Computing announced it is now available on Microsoft Azure as a preview. According to the company, its customers have been demanding Azure and flexibility across their cloud strategy. “Organizations continue to move their data analytics to the cloud at an increasing pace, with the cloud data warehouse at the core of their strategy. Customer demand for an Azure-based data warehouse is also on the rise. We’re working with Microsoft to provide the performance, concurrency and flexibility that Azure customers require from a modern, cloud-built data warehouse,” said Bob Muglia, CEO of Snowflake. Microsoft announced a new library for high performance IO in .NET. System.IO.Pipelines targets .NET Standard and is designed to work with all .NET implementations. According to the company, the library derived from the .NET Core team as it tried to improve the web server Kestrel. The work started out as a implementation inside of Kestrel and turned into a re-usable API for .NET developers now known as System.IO.Pipelines. Google announced it has partnered with developer Tania Finlayson to bring Morse code to Gboard for iOS as well as improve Morse code for Android. In addition, the company released an Android, iOS and desktop game to help users learn how to type in Morse Code. “I’m excited to see what people will build that integrates with Morse code—whether it’s a keyboard like Gboard, a game, or educational app, the possibilities are endless. Most technology today is designed for the mass market. Unfortunately, this can mean that people with disabilities can be left behind. Developing communication tools like this is important, because for many people, it simply makes life livable,” Finlayson wrote in a Google blog post.